"A Day in the Life of a Song"
A new song was sung at Gettysburg National Cemetery during this year's commemoration of Lincoln's Address, given there 138 years ago on November 19, 1863. 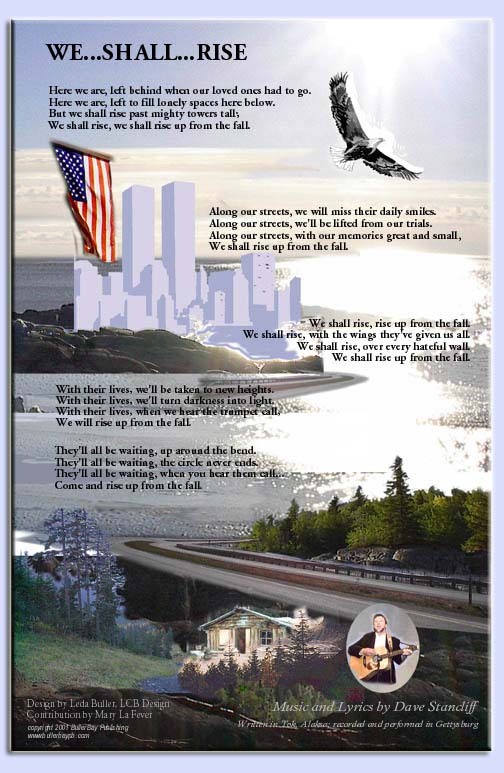 The song, "We Shall Rise", was written by Alaskan songwriter and legislative aide Dave Stancliff in the days following the tragedies of September. Akin to Lincoln's address, it is a song of hope, a song of healing, a song that honors those lost and those left behind. It was prompted not by the ancient dead of the Civil War, but by the recent losses in New York City and at the Pentagon in Washington, DC. It's premiere at the National Cemetery was the first of four performances of the song that day.This is the story of that song, and that day. It is also the story of how a ninth generation American from Alaska with a serious folksinging habit and a Blues singer and guitarist from North Carolina came together with other people of good will in Gettysburg and around the nation to do something positive in response to the events of September 11th. By his own account, Stancliff was not content with the helplessness that came from watching the towers of the World Trade Center fall again and again on the news. He began writing:Here we are left behind when our loved ones had to go.Here we are left to fill lonely spaces here below.But we shall rise....past mighty towers tall.We shall rise...........rise up from the fall....As the song came into shape, Stancliff began looking to Gettysburg, a place where President Lincoln offered an address that changed a nation over the fresh graves of tens of thousands of Americans, a place that resonates in sympathy every time a great and senseless loss of life occurs. He left his job, withdrew some of his retirement funds and headed to Pennsylvania with a song in his pocket and a guitar under his arm. And he began scrambling, talking to everyone he knew about the song and his plans to give it to the American people, to record it and provide the proceeds from its sales to the survivors fund for the firefighters. He had a dream and no clear way to it. But he had the dream. It was Charles Williams, a renowned, classically trained singer and vocal coach, who connected Stancliff with the singer who became co-producer, arranger and vocalist for the song. Stancliff called Williams from his log cabin in Tok, Alaska, told him about his project and then laid the phone down on the table and played the song into the receiver. When he finished, Williams was in tears. The song had moved him deeply. And he gave Stancliff one name: "Scott Ainslie. You need to get Scott Ainslie to sing this song. "Williams called Ainslie at his home in Durham, NC, and told Ainslie's answering machine that he'd given his name to an Alaskan songwriter and friend for a recording project in Gettysburg. According to Ainslie, his enthusiasm was obvious. Then email arrived from Stancliff with a link to a rough guitar demo of the song that was up on Stancliff's website. Ainslie listened to that, had a conversation with Stancliff on the phone and they went to work focusing the song lyrics. They were simply two strangers linked by an idea. Stancliff had a recording studio lined up to donate time and expertise, he had other musicians signing on to help with the track. He and Ainslie scheduled a recording session in Gettysburg. Stancliff was nervous. He'd never heard Ainslie sing. He'd never met him, knew nothing about him other than what he could extrapolate from the lyric changes Ainslie suggested and how he'd argued for them. Stancliff was going on faith. The whole project was running on faith, hope, goodwill, and Stancliff's savings.Through a series of recording sessions at Catalyst Studios in Gettysburg, "We Shall Rise" began to take shape. Ideas were pursued and dropped, tracks were added and then trashed. Dozens of people became involved in the project. Stancliff began looking for places to perform the song, advancing the song during the day and recording, mixing, and losing sleep over it at night. Stancliff says, "It was endless work to get from a vision in the Alaskan wilderness to Lincoln's date in the National Cemetery in Gettysburg. "November 19th was the deadline, the anniversary of the Gettysburg Address. It seemed fitting. The song was added to the program for the commemoration which began at 10:00 a.m.. It was slated to be performed in the Legislature in Harrisburg at 1:00 p.m. It was welcomed onto the program for the annual gathering of a thousand emergency services workers in Harrisburg, along with the Governor of Pennsylvania, at 7:00 p.m. And, finally, it was chosen to close a scholarly conference on Lincoln and Slavery back at Gettysburg College at 9:00 that night. Stancliff had been busy. After driving almost all night Sunday, Ainslie met Stancliff at Gettysburg National Cemetery at 8:15 a.m. According to Ainslie: "Fifteen hundred people showed up to hear a remarkably accurate-looking Lincoln impersonator give a folksy version of the Address, to hear Senator Durbin speak on sacrifice and resolve, to hear a local baritone sing an accapella version of the Battle Hymn of the Republic, followed by the premiere of "We Shall Rise", and the benediction. "Ainslie was introduced and spoke briefly about the project's volunteer nature, announced that the proceeds from the song were going to the fund for the lost firefighter's families, and introduced Dave Stancliff, who was in the crowd. Ainslie then noted, "Following the eleventh of September, Stephen Jay Gould, writing in the New York Times, made the observation that while it takes years of painstaking labor to raise a building up, it takes only minutes to bring it down. And similarly, in what Gould called 'the Great Asymmetry' of human life, every quick and devastating act of violence and hatred by terrorists or dictators is counterbalanced by tens of thousands of often un-attributable daily acts of kindness and compassion. We offer this song," Ainslie continued, "as part of our contribution to create that balance. "In the quiet of the lifting fog, Ainslie offered "We Shall Rise" to its first audience, singing its chorus twice at the end to prolonged applause:We Shall Rise, rise up from the fall.We Shall Rise, on the wings they've given us all.We Shall Rise, over every hateful wall!We Shall Rise up from the fall.Ainslie and Stancliff exchanged a handshake and a few words after the end of the ceremonies and then Stancliff headed for Harrisburg, while Ainslie broke down the sound equipment. He was asked to autograph the lyrics in the program by some audience members. According to Ainslie, "While I was signing autographs, a man was standing patiently in line behind a family of four kids, who all wanted autographs. As he got to me, he said, 'I have a special one for you. Make it to Lisa. Lisa Beamer. '"Todd Beamer was the man on the plane that was crashed into the field in Pennsylvania who was overheard on his cellphone to say, 'Are you guys ready? Let's roll.' Lisa is his widow, the mother of their two children. Ainslie said, "I stood quietly for a moment in the tumult of the crowd, brought suddenly so close to history and tragedy, with the program and lyrics of the song on the hood of the Volvo. I wrote a note to Lisa Beamer, assuring her that she was in our prayers, and asking her to please send us an address so that we could get her a copy of the song. While Ainslie was signing autographs and loading sound equipment, Stancliff was looking for parking near the Capitol in Harrisburg, where the song was to be introduced and to become the first song ever sung on the floor of the House of Representatives. Ainslie followed him there and they hooked up on the floor of the House, a couple of guys with guitars.Stancliff's presentation of the song followed the introduction of an Italian delegation. When Stancliff asked the legislators to rise, they all came to their feet clapping through the last chorus and beyond. Ainslie and Stancliff toured the Capitol, dedicated in 1906, with the head of Restoration and then headed over to the Emergency Services Banquet. One thousand commanders of fire companies and emergency services from all over Pennsylvania came together at the Radisson in Harrisburg for their conference banquet and a program featuring the Governor. As Ainslie describes it, "The Governor was held up and so the agenda was juggled, putting us before his remarks. Just prior to the song, a seventeen minute video from ABC was shown, profiling a fire company in NYC that was shot and first aired a couple years ago. It was re-edited and aired again after September 11th. Throughout the video firemen were shown talking about how dangerous the work could be, how much they loved it, how while their families were afraid for them as they began each day, they were also proud of them. "In the re-edited version we were watching, there were titles burned in as the men were talking: their names, their rank and fire company, and the words 'Missing: 9/11/01'. For an audience of a thousand firefighters, the video hit hard. Perhaps twenty-five proud, smiling men, profiled in the midst of doing the work they loved---to a man, all of them were gone. After the video, all the Master of Ceremonies said was, "Please welcome to the rostrum, Scott Ainslie." Ainslie says, "I bet you never thought there'd be a guitar player on the bill tonight," and put on his guitar. Then he continues, "We've just seen an amazing document. And we can all be grateful to ABC for sharing it with us this evening. But we also know that before long, a new story will come along and capture the media's attention, and the bright lights and cameras will turn away. And we also know that when that happens, you, and the men and women you work with, will still be running into burning buildings to save our lives and our property." And he goes on, "This song is our way of saying 'Thank you' to all of you. "There were a lot of fire fighters fighting back tears when the song was done. Ainslie introduced Stancliff for a few words about their hopes and plans for the funds raised by the song. Then the Governor was introduced. He seemed genuinely moved by the song and after starting his remarks, called for another round of applause for "Dave and Scott". Ainslie said, "It was amazing to sing this song in these two contexts on its first day: Gettysburg National Cemetery, and in front of a thousand firefighters. I feel like we've sung for both the living and the dead today. We have one more to go." Following the Emergency Service's Banquet, Stancliff sang the song again to conclude an evening lecture and conference on Lincoln and Slavery at Gettysburg College. He followed Ira Berlin who was making the argument that history and memory were different. He said that if ten thousand people all remembered the same thing, this was still not history. History is contained in documents and artifacts. It is compiled; it is written. Memory carries emotion. It is unstable. And Berlin, having made this distinction, closed by advancing the idea that we need to make a place in history for emotion and memory; and we need to find a place in memory for history. Neither unto itself is sufficient. To fully understand what's happened to us, we need both. Placing the song on the heels of his argument seemed like a perfect way to end the day. And Ainslie says, "Then we collapsed." Here we are---left behind---when our loved ones had to go. Here we are---left to fill------lonely spaces here below. But we shall rise, we shall rise---past mighty towers tall. We shall rise, we shall rise----we shall rise up from the fall. Along our streets, we will miss they're daily smiles. We will rise up from the fall. We shall rise, rise up from the fall. We shall rise, on the wings they've given us all. We shall rise, over every hateful wall. With their lives, we'll be taken to new heights. They'll all be waiting, up around the bend. They'll all be waiting, the circle never ends. Come and rise up from the fall.